Not to be confused with zoning. Land use involves the management and modification of natural environment or wilderness into built environment such as settlements and semi-natural habitats such as arable fields, pastures, and managed woods. It also has been defined as "the total of arrangements, activities, and inputs that people undertake in a certain land cover type." 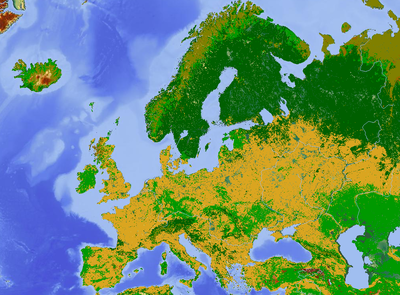 A land use map of Europe—major non-natural land uses include arable farmland (yellow) and pasture (light green). Land use practices vary considerably across the world. The United Nations' Food and Agriculture Organization Water Development Division explains that "Land use concerns the products and/or benefits obtained from use of the land as well as the land management actions (activities) carried out by humans to produce those products and benefits." As of the early 1990s, about 13% of the Earth was considered arable land, with 26% in pasture, 32% forests and woodland, and 1.5% urban areas. Land change modeling can be used to predict and assess future shifts in land use. As Albert Guttenberg (1959) wrote many years ago, "'Land use' is a key term in the language of city planning." Commonly, political jurisdictions will undertake land-use planning and regulate the use of land in an attempt to avoid land-use conflicts. Land use plans are implemented through land division and use ordinances and regulations, such as zoning regulations. Management consulting firms and non-governmental organizations will frequently seek to influence these regulations before they are codified. In colonial America, few regulations existed to control the use of land, due to the seemingly endless amounts of it. As society shifted from rural to urban, public land regulation became important, especially to city governments trying to control industry, commerce, and housing within their boundaries. The first zoning ordinance was passed in New York City in 1916, and, by the 1930s, most states had adopted zoning laws. 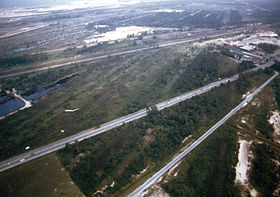 In the 1970s, concerns about the environment and historic preservation led to further regulation. Today, federal, state, and local governments regulate growth and development through statutory law. The majority of controls on land, however, stem from the actions of private developers and individuals. Three typical situations bringing such private entities into the court system are: suits brought by one neighbor against another; suits brought by a public official against a neighboring landowner on behalf of the public; and suits involving individuals who share ownership of a particular parcel of land. In these situations, judicial decisions and enforcement of private land-use arrangements can reinforce public regulation, and achieve forms and levels of control that regulatory zoning cannot. Two major federal laws have been passed in the last half century that limit the use of land significantly. These are the National Historic Preservation Act of 1966 (today embodied in 16 U.S.C. 461 et seq.) and the National Environmental Policy Act of 1969 (42 U.S.C. 4321 et seq.). Land use and land management practices have a major impact on natural resources including water, soil, nutrients, plants and animals. Land use information can be used to develop solutions for natural resource management issues such as salinity and water quality. For instance, water bodies in a region that has been deforested or having erosion will have different water quality than those in areas that are forested. Forest gardening, a plant-based food production system, is believed to be the oldest form of land use in the world. The major effect of land use on land cover since 1750 has been deforestation of temperate regions. [dead link] More recent significant effects of land use include urban sprawl, soil erosion, soil degradation, salinization, and desertification. Land-use change, together with use of fossil fuels, are the major anthropogenic sources of carbon dioxide, a dominant greenhouse gas. According to a report by the United Nations' Food and Agriculture Organization, land degradation has been exacerbated where there has been an absence of any land use planning, or of its orderly execution, or the existence of financial or legal incentives that have led to the wrong land use decisions, or one-sided central planning leading to over-utilization of the land resources - for instance for immediate production at all costs. As a consequence the result has often been misery for large segments of the local population and destruction of valuable ecosystems. Such narrow approaches should be replaced by a technique for the planning and management of land resources that is integrated and holistic and where land users are central. This will ensure the long-term quality of the land for human use, the prevention or resolution of social conflicts related to land use, and the conservation of ecosystems of high biodiversity value. The urban growth boundary is one form of land-use regulation. For example, Portland, Oregon is required to have an urban growth boundary which contains at least 20,000 acres (81 km2) of vacant land. Additionally, Oregon restricts the development of farmland. The regulations are controversial, but an economic analysis concluded that farmland appreciated similarly to the other land. ^ Village of Euclid, Ohio v. Ambler Realty Co.
^ Nolon, John R., Local Land Use Control in New York: An Aging Citadel Under Siege (July/Aug. 1992). New York State Bar Journal, p. 38, July–August 1992. ^ Merrill, Dave; Leatherby, Lauren (July 31, 2018). "Here's How America Uses Its Land". Bloomberg. Retrieved 2018-08-05. ^ Ameztegui, Aitor; Coll, Lluis; Brotons, Lluis; Ninot, JM (2016). "Land-use legacies rather than climate change are driving the recent upward shift of the mountain tree line in the Pyrenees" (PDF). Global Ecology and Biogeography. 25 (3): 263–273. doi:10.1111/geb.12407. hdl:10459.1/65151. ^ Robert Hart (1996). Forest Gardening. p. 124. ISBN 9781603580502. Forest gardening, in the sense of finding uses for and attempting to control the growth of wild plants, is undoubtedly the oldest form of land use in the world. ^ Jaeker WG, Plantinga AJ (2007). How have Land-use regulations Affected Property Values in Oregon? Archived 2012-07-22 at the Wayback Machine OSU Extension. This page was last edited on 6 March 2019, at 04:08 (UTC).